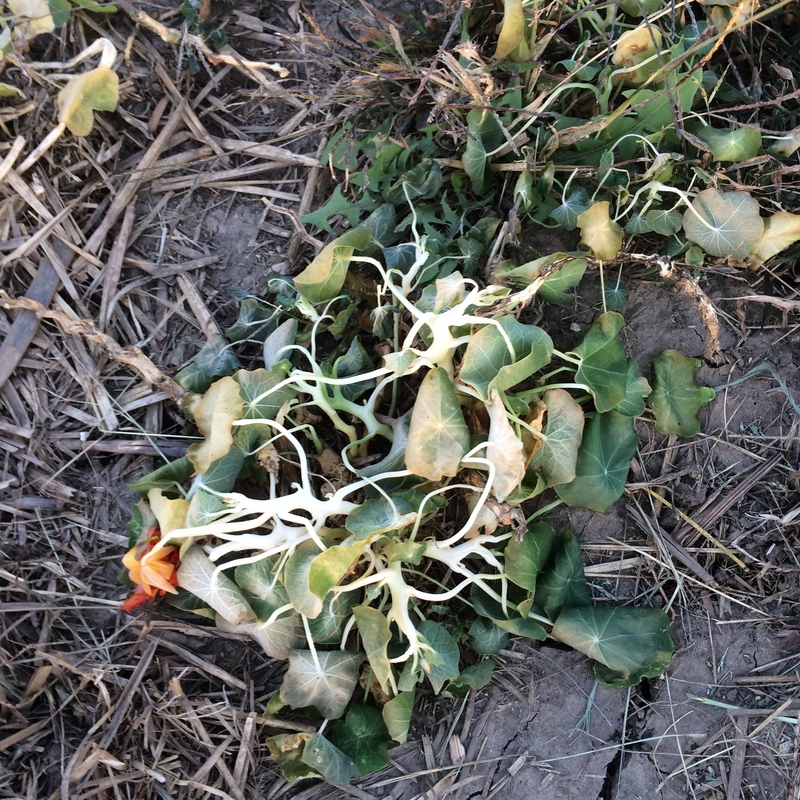 Farm Season 2015 In Conclusion…. 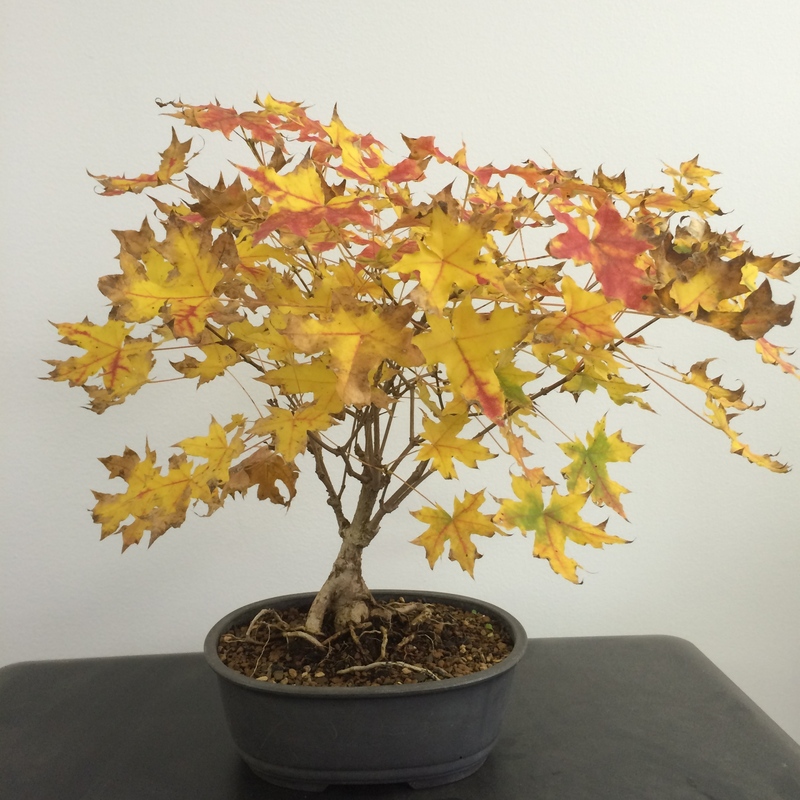 I have had a lot of help over the years and this year was no different. To all my “farm hero’s” ……… I would like to give a special thank you to the Hendrick family and Sue Dawson who not only support me financially but in vision and goals as well. 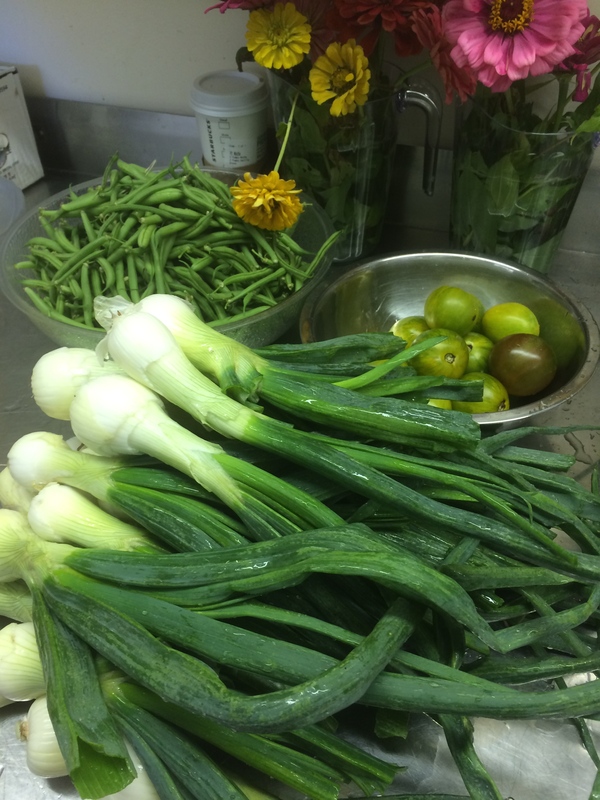 Thank you to the talented chefs who take all the produce grown. Big thanks to Sarah for all of your support and hard work this year. Thank you Terrin, my one steady volunteer. Thank you to my U of I family Rick Weinzierl, Mary Hosier, Jeff Kindhart, Kenny Ehler, Bryan Warsaw, Matt Turino and Chris. You changed my life with knowledge and friendship. Finally a big thank you to my dear friends Jeremy, Michael, Billy and the Kinkelaar family. It’s always a long six months until we are reunited. The laughs are contagious and it’s rare that you wake up every day looking forward to work but that is how I felt seeing you guys every day. From the bottom of my heart thank you for everything! The First Frost of the Year! 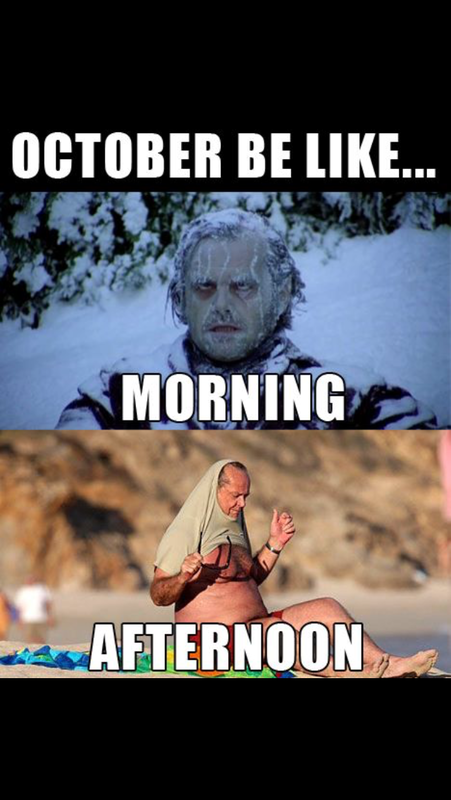 This pretty much sums up the weather the last week. It has been freeeeeeeezing in the mornings and warming up in the afternoons to the mid 70s. By the time the day is finished there is a pile of clothes laying in the passenger seat of my car from all the layers I had to strip off. We had our first frost over the weekend. I was petrified to look at the farm afterwards because I still have lettuce, kale, chard, herbs, broccoli, green onion, green beans and peppers in the ground. As I slowly pulled up to the plot to survey the damage I saw the death and destruction. 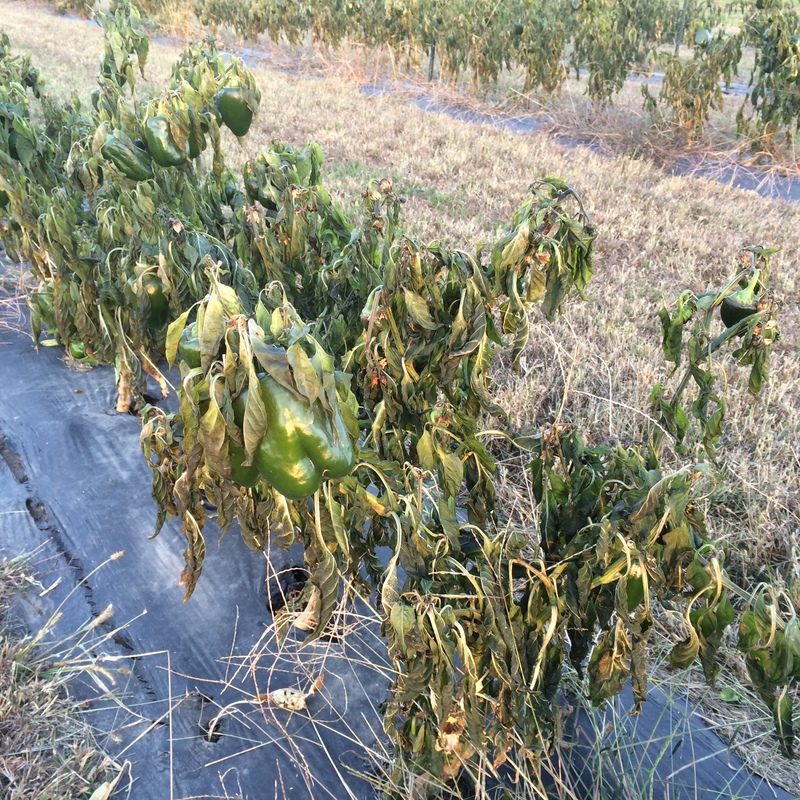 It totaled the peppers and green beans. The peppers were almost finished but I was really hoping to get another harvest of the beans this week. Mother nature put a kibosh on that. Thankfully the rest of the crops were untouched and I had a great harvest of romaine yesterday. I am hoping to get the rest out of the ground by the end of the week. I got all the tomatoes unclipped and pulled from the plastic (over 2,000 plants). Yowza, my back hurt! I am really looking forward to the day someone develops biodegradable tomato clips. I am going to remember the tedious removal next year so that I am careful to only put clips on where they are ABSOLUTELY needed. The trellising came down yesterday and it now looks like a sad barren brown spot ready for winter. I will be pulling plastic and drip on the rest of the tomato bed, peppers and green beans, which will be the rest of the plastic on the farm. I have been slowly breaking down the farm as I go so this is pretty huge that this will be one whole 1/2 acre finished. Its all downhill from here! People keep asking me if the farm is over. My answer is NO NO NO NO NO! 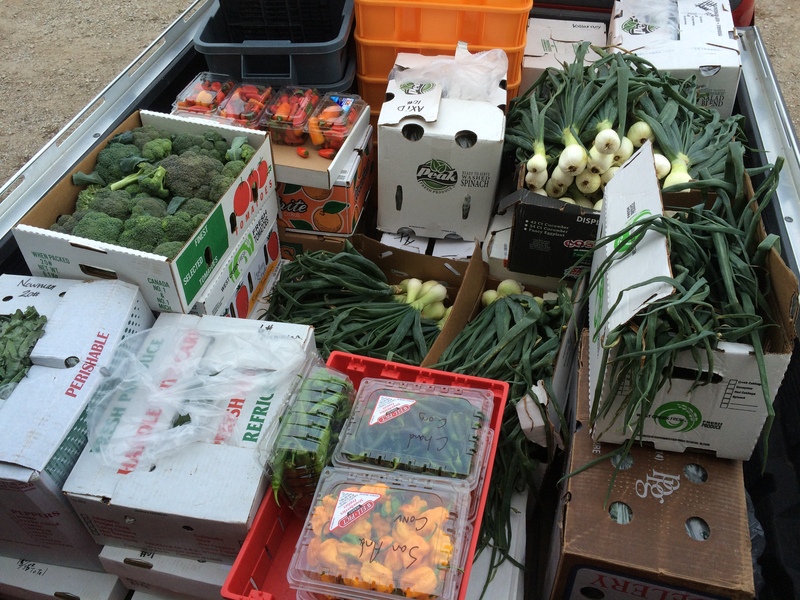 ….. and then I show them the picture below which was this morning’s delivery. I still have an acre of produce in the ground people! This is the downward slide but definitely not the end!!! 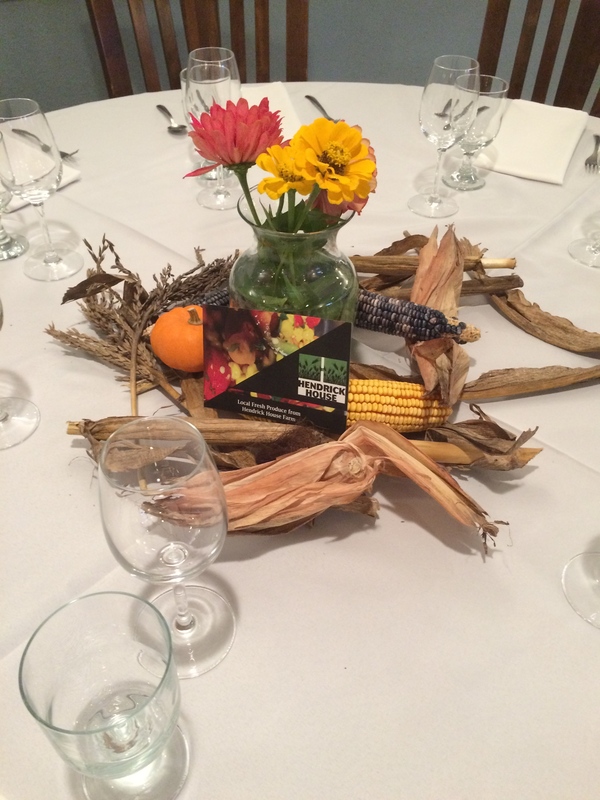 We had our first HH farm to table dinner at Kappa Delta sorority last Wednesday. It accomplished all the goals we anticipated. It was amazing exposure and marketing for the farm, it solidified relationships between the clients and the chef (Andy Mullins) and it showed the range of product that can be offered with Hendrick House food service. 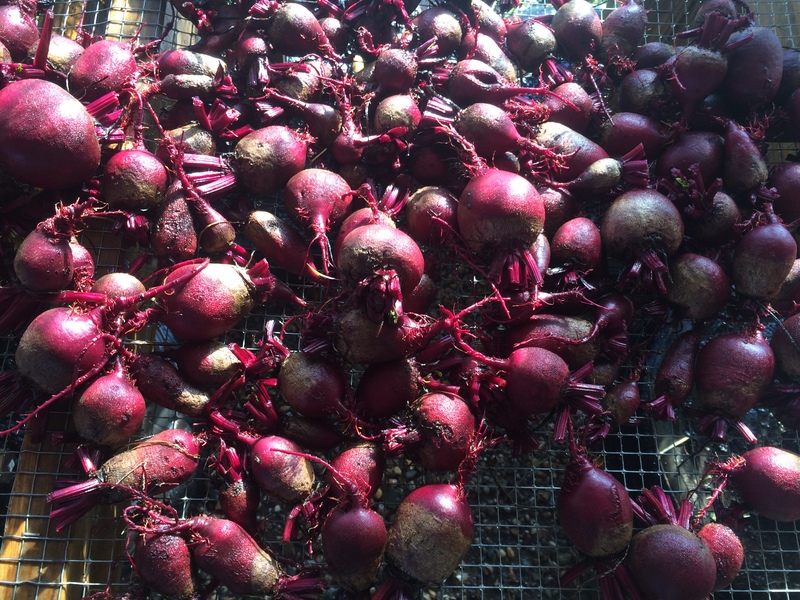 On a personal note, I love being able to harvest product that morning and cooking with it in the afternoon. The smells and flavors are completely consuming. There is so much more care that is taken with product when you have a stake in it are the one who picked the variety, planted it, cared for it, fed it, watered it and harvested it. The chefs can say the same thing and take ownership in the fact that they ultimately decide what is grown. 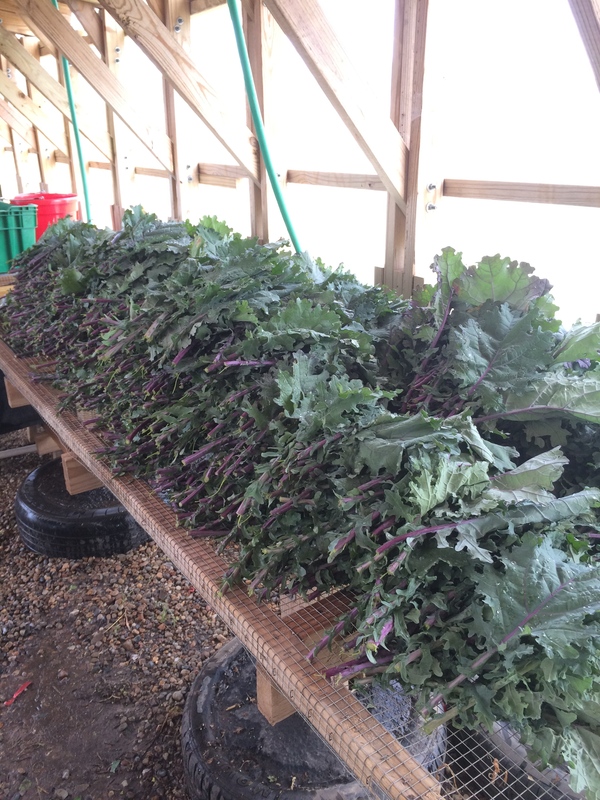 If even a portion of that feeling ( the appreciation for food grown less than a mile away with complete control of flavors) can be conveyed to the clients through their chefs then to me this farm project can be deemed successful. The air of excitement throughout the house was magnetic, from the kitchen to the dining room. I was even able to get members of AKL fraternity to come and help serve, which created double exposure for all of the positive attributes associated with this event, listed above. 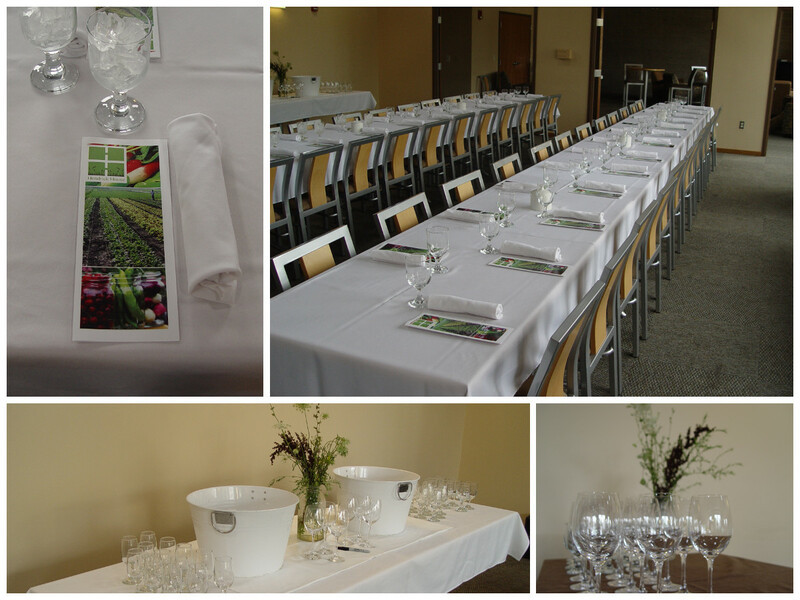 The tables were dressed in white linens with crisp white linen napkins. The table decorations were all from the farm, cut flowers donated by the U of I Student Sustainable Farm and blue corn with husks donated from the U of I from my good friend Jeremy Shafer. We poured sparkling grape juice in place of champagne and had carafes of ice water placed at each table. 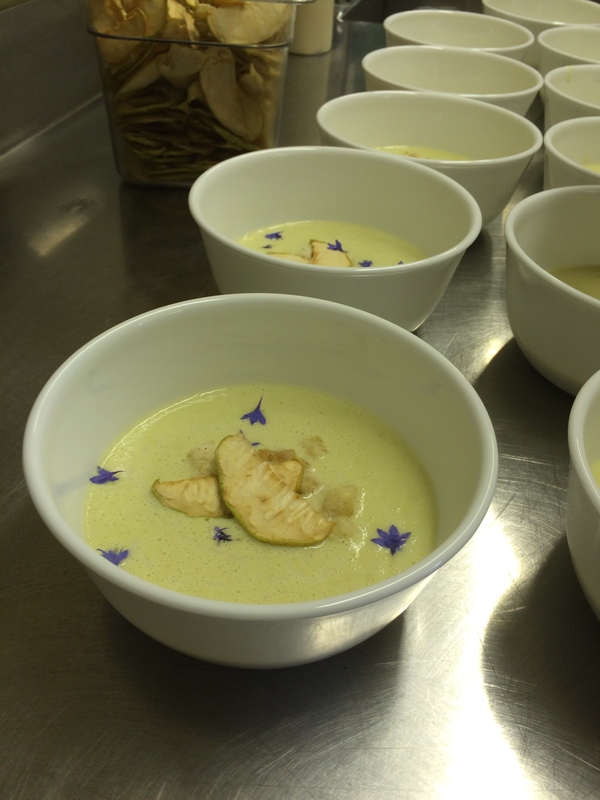 The first course was a vichyssoise made from the beautiful spring onions from the farm. It was paired with apples given to me by my friend Rick Weinzierl which were turned into apple cream and apple crisps by Andy. We also used fresh horseradish given to me by my friends Bill and Dale who work with the U of I Aboretum. 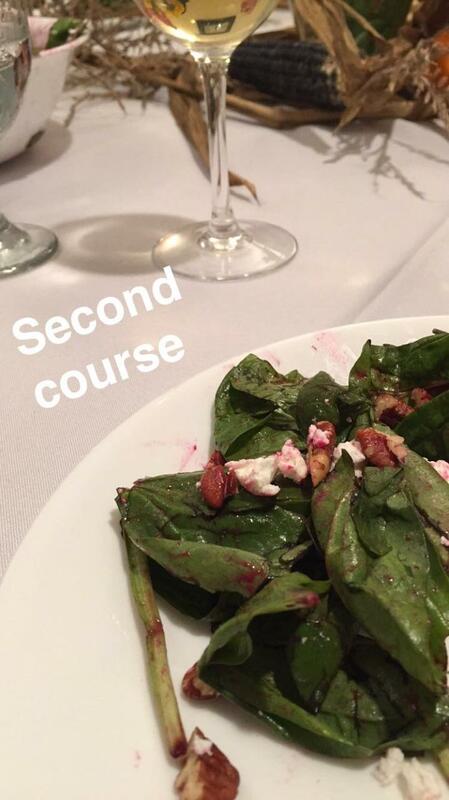 The second course was a spinach salad made with beautiful big red beets (from the farm) and Prairie Fruits Farm chèvre. 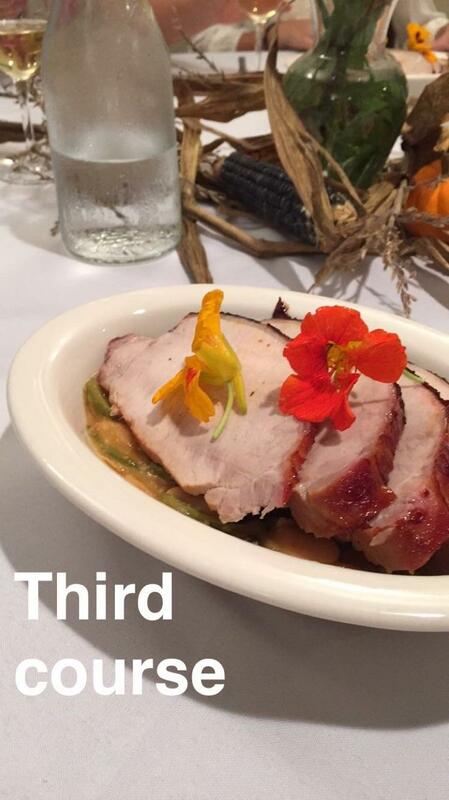 We served pork tenderloin for the entree with HH farm kale and HH green bean braise. 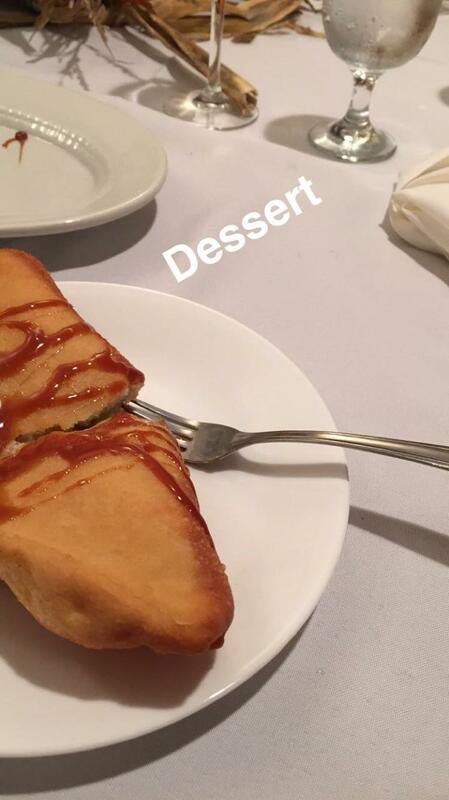 The dessert was apple and white cheddar turnovers and caramel. The apples came from Rick and the cream that went in to the caramel sauce was from Kilgus Farmstead (up near Fairbury, Illinois). I do have to add that it is very important when coming up with a menu to think about the equipment that will be available to you when cooking and executing the dinner. 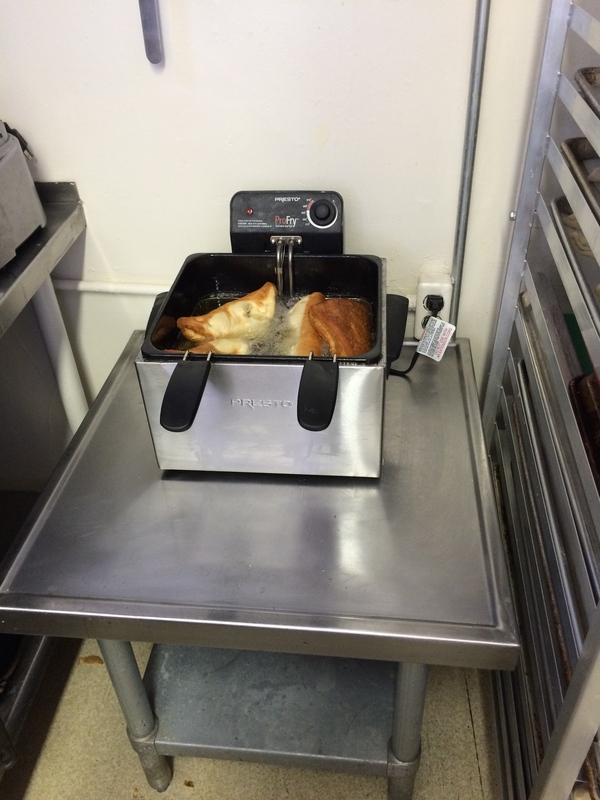 I didn’t realize Andy didn’t have a fryer in his kitchen so it was pretty comical attempting to fry over 100 turnovers in my little fry daddy. I have to give a special thanks to Andy Mullins for partnering with me for the day and lending me his kitchen helping to market the farm. 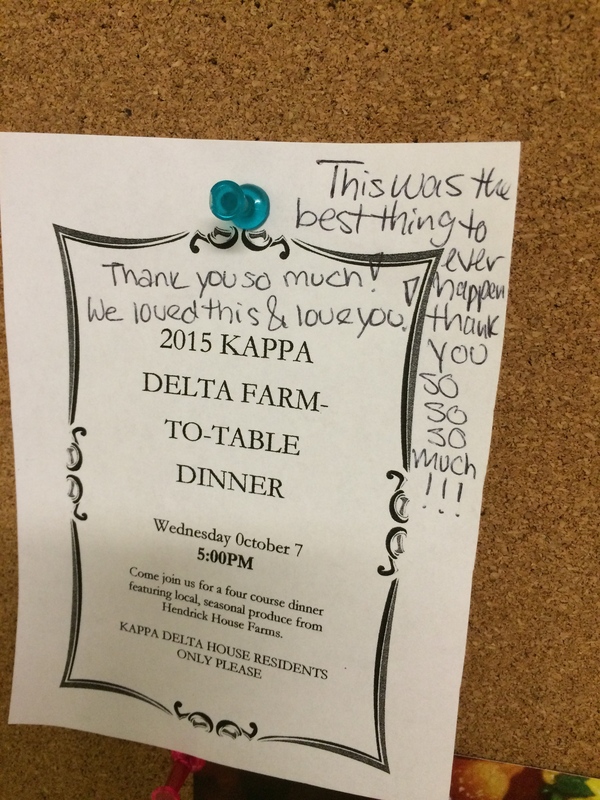 Thank you also to the girls of Kappa Delta for letting us do this dinner for you and also for taking pictures. Big thanks to the boys at AKL for always supporting me and the farm and showing up to be wonderful, diligent servers. I definitely look forward to doing more of these events in the future! Chef Bonnie Collins took over the reins as Hendrick House’s executive chef this year and as the semester is wrapping up, I thought I would take a few minutes of her time to chat with her about some of her time before the Hendrick House. When asked where she got her start, she told me about cooking with her parents as she grew up on their family farm. After a high school job at Steak n’ Shake, Bonnie thought she would never get another foodservice job, but landed a position at Baytowne Bar & Grille instead. It was there that she started managing the menu, planning luncheons & banquets, and got a real taste for what being a chef might entail. From there, she got a job with Kamakura where she quickly rose through the ranks to the position of head chef after only a year. 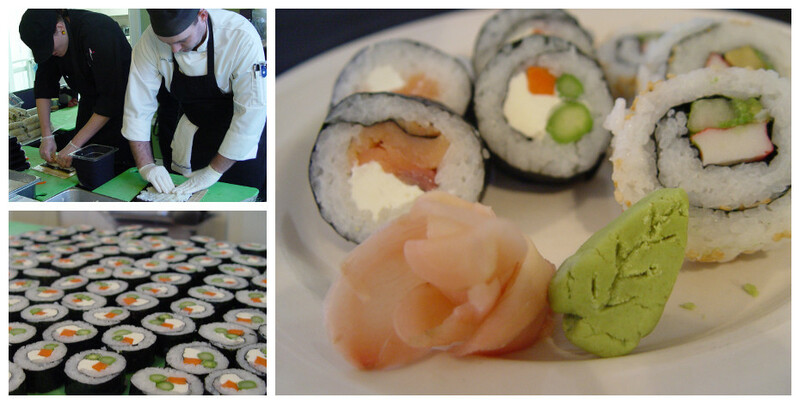 Bonnie spent 5 years at Kamakura and it was through that experience that she helped launch the sushi program at Hendrick House. Once a week, her hand-picked team will go to one of the Greek houses that one of our chefs is at and roll and serve sushi for dinner. Of course, that couldn’t happen until she was hired onto the Hendrick House staff back in 2010. Again, Bonnie impressed everyone around her with her ability to produce amazing food. 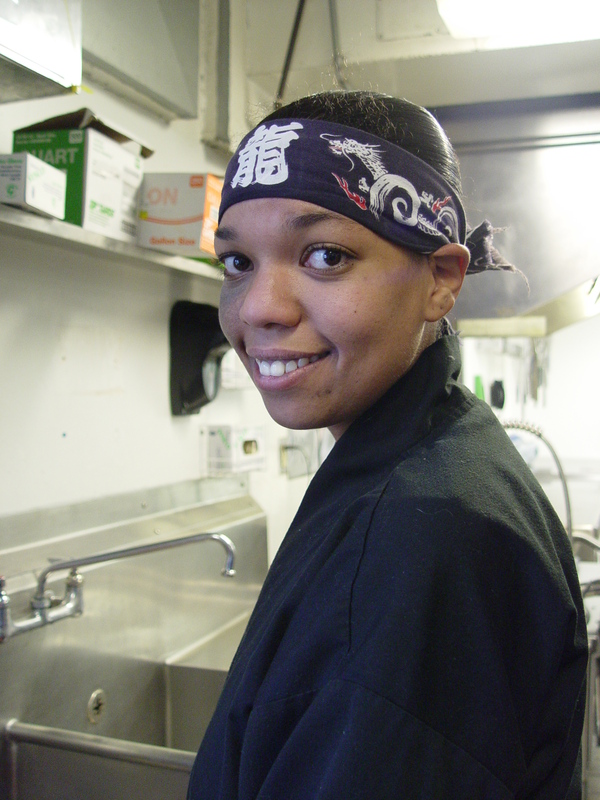 After just a short while, she was the head chef at one of our sororities and consistently performed above and beyond.It was because of this stellar track record that when the executive chef position opened up at the dorm, Bonnie seemed the natural choice. It’s not uncommon if you have to pass through the Hendrick House kitchen to hear Bonnie’s laughter or her singing along with just about any and every song that comes on the radio, and it’s a daily event to see the students of Hendrick House passing through the dining area, struggling with the decision of what they won’t have room to eat as Bonnie has once again risen to the occasion. I wanted to hijack the blog for a moment during all the hustle and bustle we’re all feeling from the impending beginning of classes on Monday to point out something. Ann and Kevin did some amazing work over the summer. There’s no way for me to properly put out there just how much work was done on the farm. I was out there for just a few days, and it was painful, but they were out there. A LOT. Thank you Ann & Kevin. Thank you to everyone else who helped them. 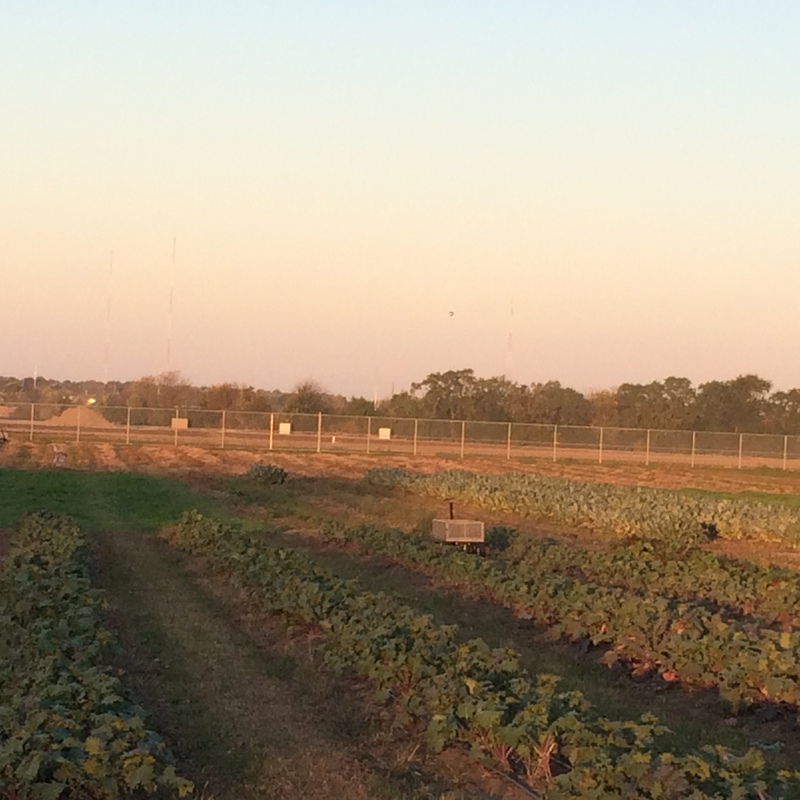 Thank you to U of I’s Student Sustainable Farms for the opportunity and the land. 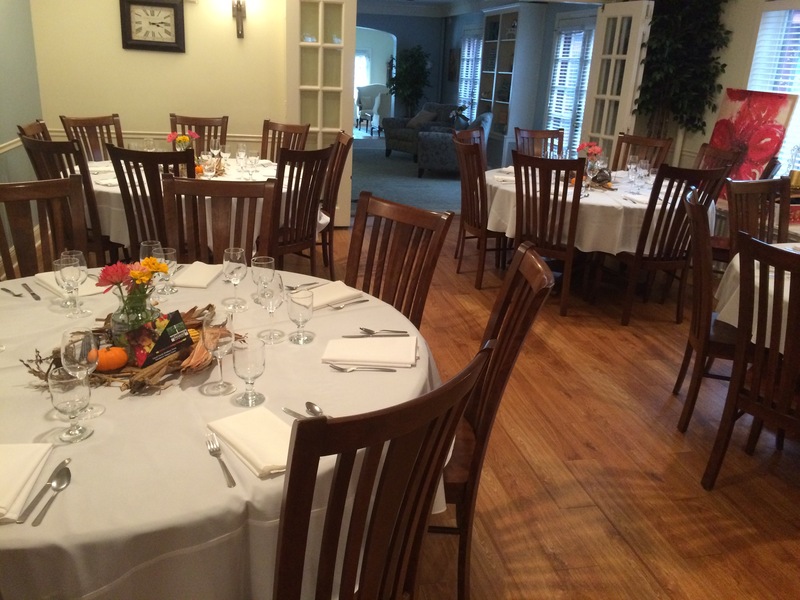 The dining room is prepared and ready for the guests to arrive. 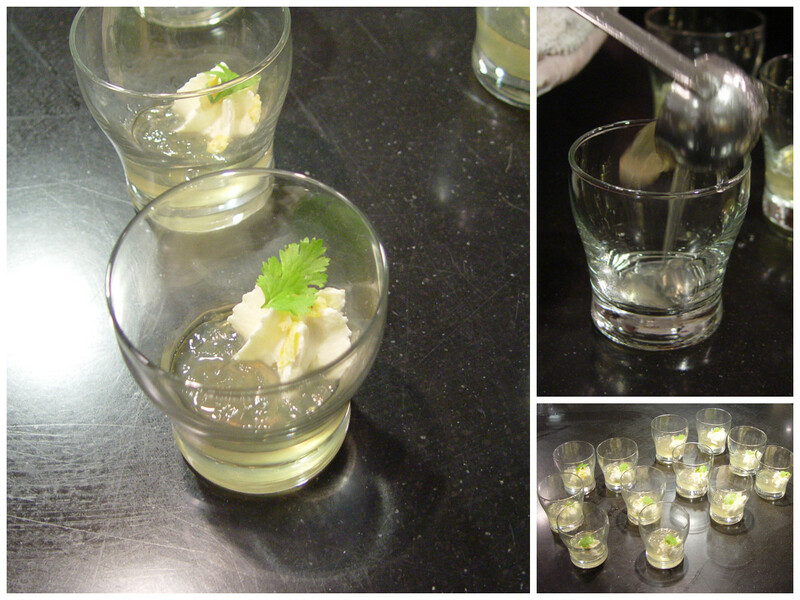 The amuse-bouche was a “Chips and Salsa” dish with salsa gelée, tortilla foam, and a cilantro leaf on top. 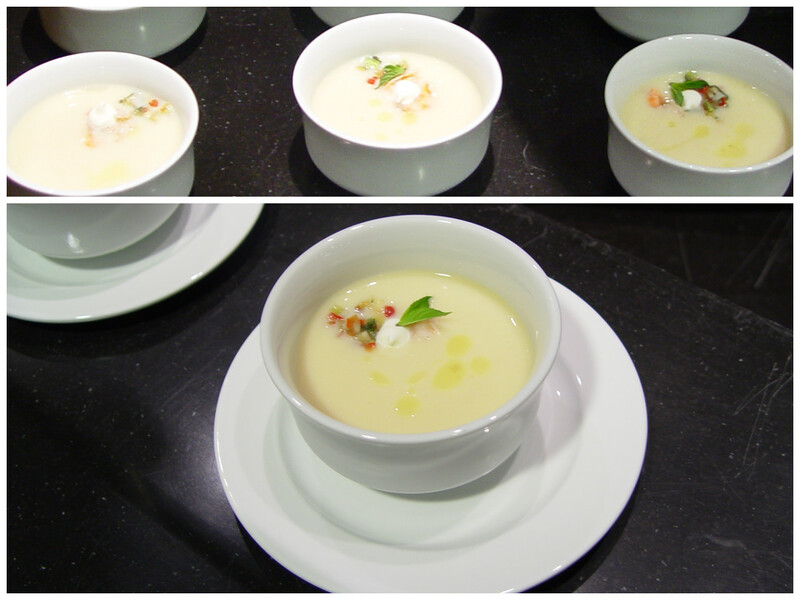 Here you can see the chilled sweet corn soup with cucumbers, squash, mint, prawns, & crème fraîche. 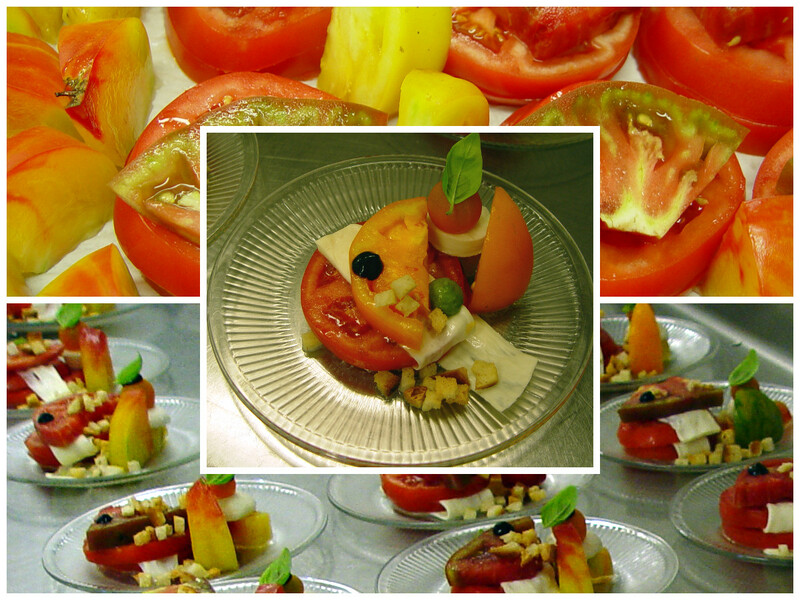 The “Caprese Salad” had heirloom tomatoes, house pulled mozzarella riboons, basil, & a balsamic gel. The main course smoked chicken with white beans, peppers, Hendrick House farm kale, & house made butter. 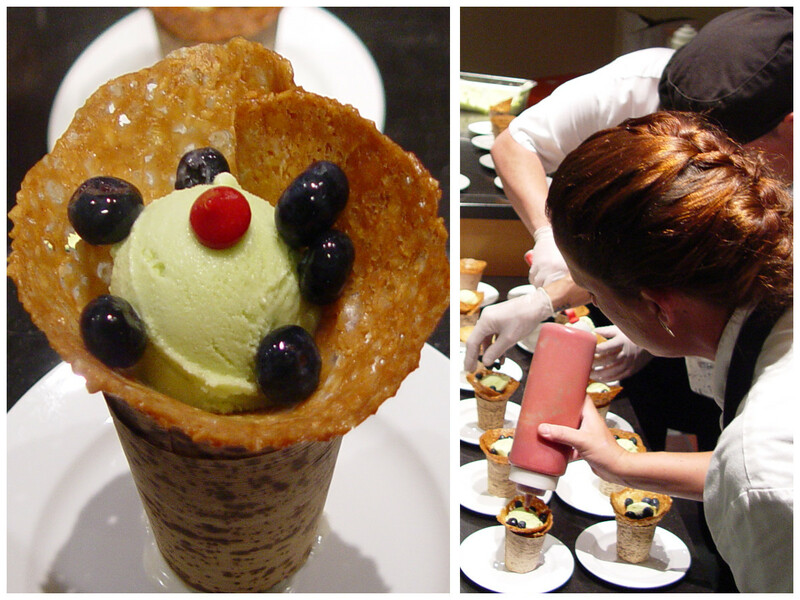 For dessert, house made basil ice cream, blueberries, & a raspberry fluid gel served in an almond basket. 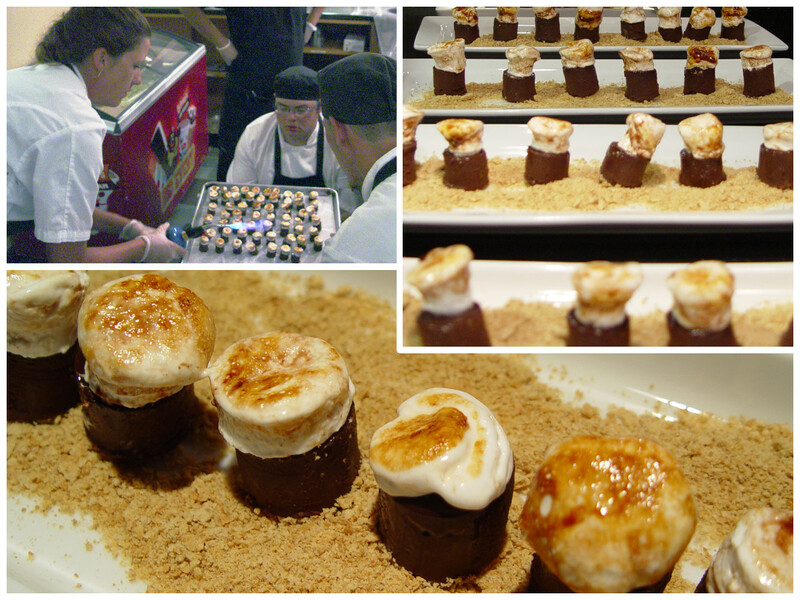 And lastly, Ann surprised our guests with a s’more mignardise.